Those who once were charmed by the jagged silhouette of the High Tatras (Vysoké Tatry / Tatry Wysokie), will sooner or later desire to climb at least one of their peaks. However, only a few of those are accessible for the general public. Perhaps the most sought-after peak of them is Rysy, a 2503 m outcrop of the main ridge. The popularity of this mountain can be attributed to the fantastic panorama one can enjoy from its top, and the fact that its secondary 2500 m summit is the highest peak in Poland as well as the fact that the border between Slovakia and Poland happens to run across it. 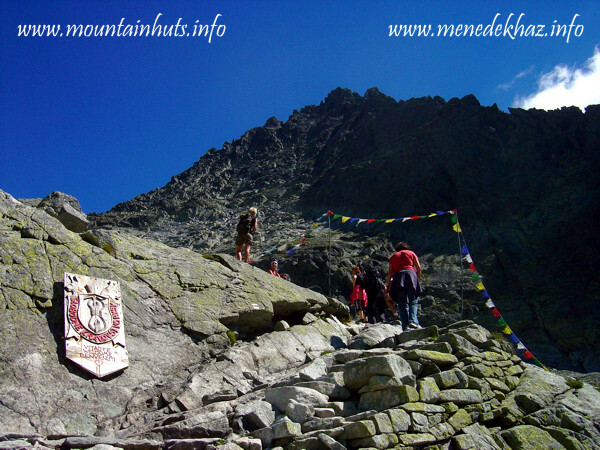 If you choose to approach the mountain from the south (Slovak) side, you will have to pass by Chata pod Rysmi ("hut under Rysy"), which is actually the highest mountain hut in the Tatra range. As the peak is accessible from the north, Polish side as well, this hut is a very frequented place, serving several thousand people each year (which includes both overnight guests and those just stopping by for a meal or a drink). In the past few years its services were quite limited, as the whole edifice was being rebuilt. 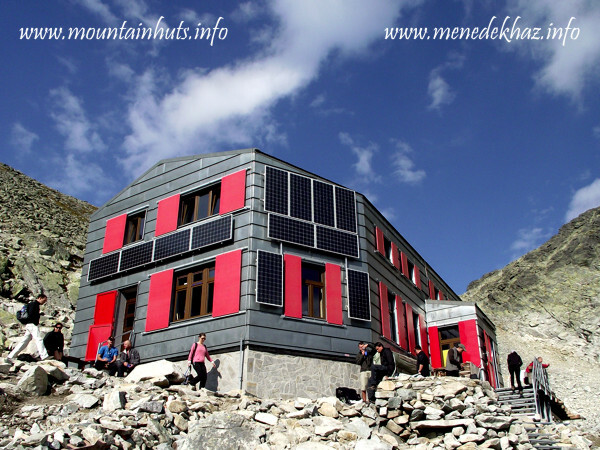 The official inauguration of the new hut took place last autumn, so I thought it was high time to write a review here on mountainhuts.info. 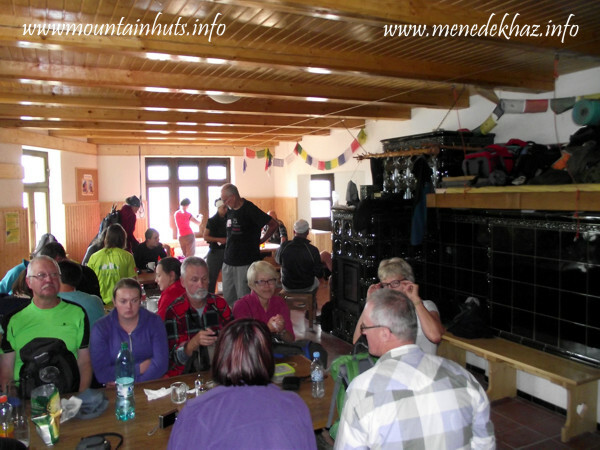 As we will see, despite the renovation, Chata pod Rysmi has remained an "authentic" mountain hut, lacking full comfort but offering a special atmosphere. By the end of the 19th century, József Pfinn (chief engineer of the railway company "Kaschau-Oderberger Bahn", and also known as the architect of the Téry Hut) proposed that the Hungarian Carpathian Association should build a hut at Váha/Waga saddle, which could be reached by a combination of cog railway and cable car (aerial tramway). Partly due to insufficient financial and technical background, partly because of negative public reactions, this idea was not pursued further in that time. Then, a few years after World War I ended (as a result of which the southern part of the Tatras became part of the newly founded Czechoslovakia) the idea came up once again, this time with the backing of the state officials. The vicinity of the border with Poland caused a lengthy debate about the exact location of the hut, which delayed the project. Finally, the decision makers agreed upon a place somewhat below the saddle, on the SE slope of Rysy. Actual construction began in August 1931, and was finished by September 1932. The single-storey building, which consisted of a dining room and a dormitory for 24 people, was officially opened the next year, on 16th July 1933. 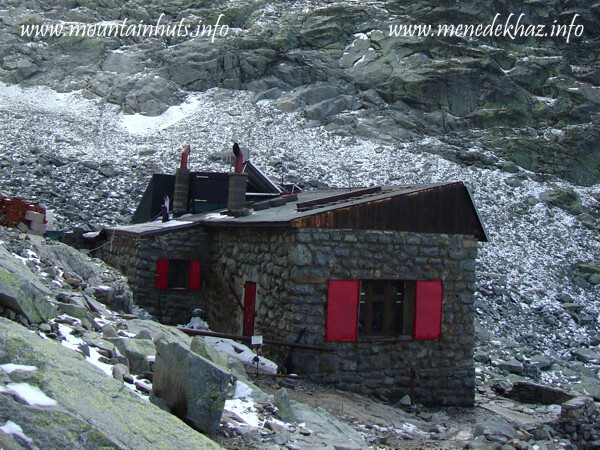 During the past 80 years, the hut has been several times partially or completely destroyed by avalanches. The event that happened in January 2000, devastated the building. Although the hut was restored afterwards, it had become clear that a completely new, massive building was needed. Initially, the owners (Slovak Mountaineering Association JAMES and the Slovak Tourist Club) wished to change the location of the hut as well (bringing it closer to the saddle, where it would be less prone to avalanches), but bureaucratic obstacles prevented getting licence for this plan for years. To end procrastination, finally a decision was made to construct a new, structurally strengthened building at the old location. Work began on the site in June 2010, and lasted for almost four years, as opposed to the originally planned two years. The delay was caused by financial problems – the costs of the construction materials, as well as the airlift services, turned out to be higher than what had initially been estimated (in the end, the total cost of the project reached 600,000 euros, a smaller portion of which was covered by private donations). During the prolonged construction phase the hut could not host any overnight guests (other than the workers) and offered only basic foods and drinks in its temporary buffet. The new hut was finally opened for the public on 25 September 2013, not long before the end of the season. Rumours are spreading that, unlike in the old times (when the hut was officially closed down for the winter season), it will be open throughout the whole year. However, such a practice would not be in line with the visiting rules of the Tatra National Park (TANAP), which clearly state that the tourist trail leading to Chata pod Rysmi is closed for ordinary hikers between 1 November and 15 June. Experiences from the winter of 2013/14 show that the hut indeed does not offer any services in the winter season. Keep that in mind even if you are exempt from the winter closure (skialpinists and mountain climbers who are members of certain mountaineering clubs). I guess it’s time to talk about the dining possibilities. 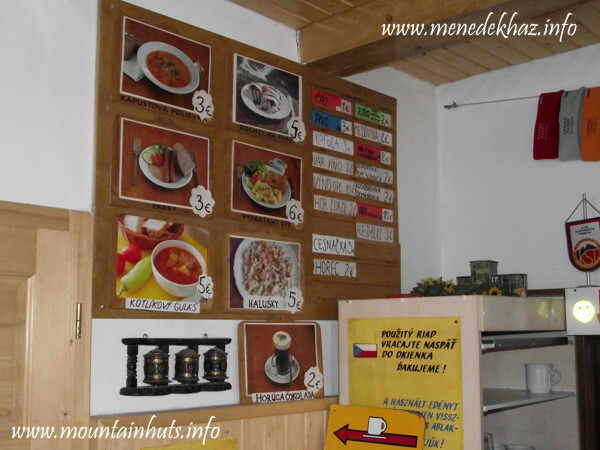 The menu offers the standard dishes of the High Tatra huts: There is the world champion cabbage soup (kápustová polievka – this is a filling dish, including tasty meat chops besides cabbage), garlic soup (cesnaková polievka), traditional dumplings with sheep cheese (bryndzové halúšky – another favourite), as well as goulash (probably not the Hungarian style, I must confess that I did not dare to try it here). If one would rather pick the super-safe way, there is boiled sausage (párky) and also fried cheese (vyprážaný syr) on offer. For dessert, delicious steamed dumplings (buchty) are a perfect choice, or we can just drink a mug of hot chocoloate (horká čokoláda) and be merry... :-) The prices are higher than in other parts of the country, but let’s remember the labour of the sherpas... after all, it’s not so expensive, is it? If sleeping at the hut, for an extra 5 euros one can enjoy a full breakfast (before the reconstruction, this was rather a "compulsory option" than a "choice", but it was worth the money – as for how things are now, I do not know yet). Of course, dinner can be ordered as well, the price of that is 8 euros. If you plan to sleep in the hut, be aware that it is necessary to book beds well ahead. The current procedure of booking is as follows: Send an SMS text message to +421-903-181051 with the desired days of your stay in the hut (date of arrival and date of departure), the number of people, your name, and whether breakfast and/or dinner is needed or not. Then wait patiently for a reply (due to the weak signal, this may arrive the next day). If your pre-booking is successful, this will include an identification code and a bank account number to which 50% of the total fee should be transferred as a deposit (do not forget to provide the identification code in the comment section). If you are done with that, notify the hut by a subsequent text message (including the identification code again) that the payment has been sent, otherwise they will not validate your booking! The beds can only be booked via SMS – there is little chance of booking them personally on the spot. The other phone number given in the hut profile is of the landline phone of the Beránek family in Nový Smokovec – once it was used as a secondary option for making a reservation, nowadays it should not be used, in order to avoid confusion. The price of accommodation hasn’t been mentioned yet, so here you go: In 2013, a night for one person cost €16. Members of selected tourist/climbing associations enjoy 50% discount (except for the winter season, when they have to pay the full fee). As mentioned in the prologue, despite the recent reconstruction, the hut does not offer full comfort. The main cause of that is the lack of a permanent water source nearby. Therefore, all guests must accept the fact that they will have to do without any kind of bathing facilities. As most people spend only one night in the hut, while traversing the main ridge from Slovakia to Poland or vice versa, this circumstance is usually not a serious problem (of course, it depends on the individual needs of a particular person). Due to the scarcity of water, there is no water closet in the hut, either. The previously mentioned "panorama toilet" is an outhouse, located on the edge of a steep rocky ledge, a little bit away from the house. The facility is cleaned regularly and rigorously, so despite the frequent usage, it could beat the water closets of other equally popular places in a cleanliness contest... In addition, its funny decoration often brings wide grins to the faces, both of those who are enjoying the breathtaking full-window view from the inside and of those who are still sitting outside on the "patience bench", waiting for the current user to finish. Well, this smile might be lacking when someone happens to have an urgent call of nature in the midst of a stormy night... but that is the price of living in the "Kingdom of Freedom", as the hut and its surroundings are described on the greeting board that welcomes the arriving visitors. Summary: The recently rebuilt Chata pod Rysmi certainly ranks among the most popular huts in the High Tatras. It is located in the heart of the beautiful mountains, just below a prominent peak commanding the most panoramic views of all Tatra peaks that are accessible via waymarked walking trails in both Slovakia and Poland. The strict regulation of hiking and mountain climbing by the national parks that manage the area does not allow this refuge to become a paradise of free mountain roaming, but the hut is a perfect stopover point for those who are traversing the range from North to South or vice versa. 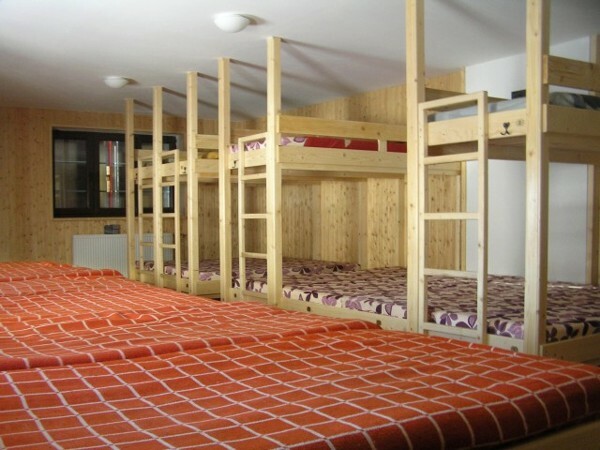 If you can accept the fact that there is no bath for a night, and successfully complete the text-sending game in order to book a bed in advance, you will surely enjoy your time in the High Tatra "Kingdom of Freedom". The unforgettable golden sunset and the endless night sky dotted with myriads of twinkling stars are priceless. For everything else, there's... Okay, that’s just a joke. Leave your credit card at home, in this hut only cash is accepted.